CSI will be closed for voice communication on Monday, September 2 for the U.S. Labor Day Holiday. The CSI host computer will be accessible as usual, and data from those exchanges that remain open will be available at their normal times. It is interesting to note that many market enthusiasts have consistently shied away from the futures arena because of the perceived high risk, while eagerly investing their money in the "safer" stock market. This is a rich irony, given that seldom, if ever, has a non-perishable futures product delivered such devastating blows as investors have suffered with Enron, WorldCom, Tyco and the like. The myth that the stock market is a safe shelter for our nest eggs lies in tatters on the financial pages of yesterday's newspaper. This month's CSI Technical Journal will explore the possibility that futures markets hold promise for recovering some of our lost financial security, either through direct speculation or through the clues the futures markets can give about tomorrow's stock prices. As many investors know, the commodity markets facilitate the exchange of raw materials required by business to fuel industry, and hence shape the destiny of the equity markets and, ultimately, the economy. Accounting conventions not withstanding, when future raw materials are expected to be abundant, equities that depend upon these raw materials will rise in price, reflecting expected profits due to low production costs. When futures become expensive due to expected short supplies, the equities that require such future raw materials are likely to drop in price. The share prices of many stocks suffer declines when the cost of raw materials and other operating expenses are expected to increase. There is a widespread failure to understand that a major difference between the futures markets and stock markets is that futures are much more like a zero-sum game. Half the futures market participants, as measured by the open interest, will record profits while the other half will show equivalent losses. In the stock market, on the other hand, it is theoretically possible for all participants to lose at the same time without anyone having sold a single share. The stock market can go into a free fall based upon public perception. This fact should help temper the indictment one might have for a particular C.E.O. of company XYZ. You shouldn't necessarily blame company management for pushing the price down when stock prices drop throughout the entire economy because of outside forces. In the past, general arguments in favor of purchasing equities were compelling. Equities paid dividends or reported profits that affected share price valuations in fairly predictable ways, whereas commodities typically responded to the forces of supply and demand. The appeal of stocks has declined significantly as recent scandals in major corporations have sent stock prices plummeting and sucked billions of dollars from investment accounts. Admittedly, there have been isolated scandals in the futures arena, but, except for an occasional currency devaluation, never have a majority of all futures markets simultaneously suffered declines from a single government action or a single futures market's influence. The effect of commodity pricing is an important influence on equity valuations, but many leading econometric indicators in the U.S. economy also affect the overall direction of share prices as a whole. Users of CSI's Unfair Advantage® data and software resources are aware of an abundance of current and historical facts that may affect various stock and futures markets. Not only can one witness the ongoing development of product pricing conditions in the futures industry and the equity markets on a daily basis, but one can also track many other similar government statistics that relate to the economy. Some of the more important indicators found in your nightly Unfair Advantage download include: Corporate Profits, released in the second month after the close of each quarter, Durable Goods Orders, released after the end of each month, and the Federal Funds rate, released daily. Most of these indicators are automatically obtained by CSI from U.S. government websites. Investors should consider these timely UA reports before making individual equity market trading decisions. If you heard on the morning news that unemployment statistics reached a new high, for example, then you could be sure that this weekly statistic would have been captured by CSI from the appropriate U.S. government website and added to the ongoing historical unemployment statistics file present in your UA inventory of econometric files. Your nightly news program will undoubtedly report upon such significant events as they unfold, but it doesn't place those statistics into a historical perspective with respect to past market behavior. When you consult Unfair Advantage's data archives each day, you will see the progression of a given series over time so that you may factor the impact of such events into your investment portfolio. Unfair Advantage will not tell you if a company has been "cooking the books," but it may well tip you off to unrealistic corporate projections or profit reports. McDonald's Corp, purveyor of hamburgers and assorted fast foods, shows some tendency to move opposite Live Cattle futures, the raw material for beef. The cost of beef is just one of many factors affecting the share price. The McDonald's series, which uses the left chart scale, has been adjusted for splits and dividends. 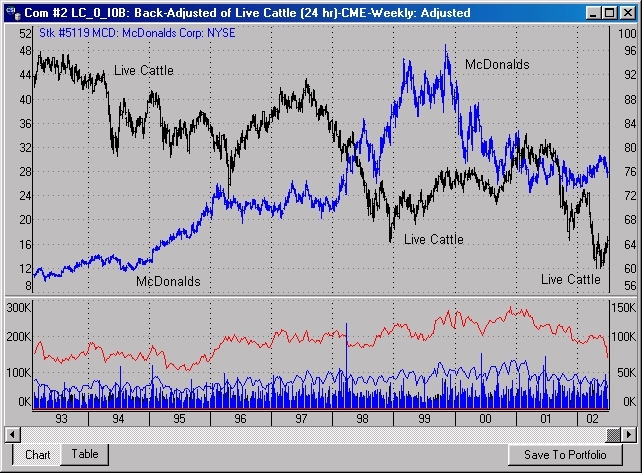 The above chart showing the price oscillations of Live Cattle and McDonald's Corp demonstrates a possible relationship between the future price of beef and the share price of a company that uses a great deal of beef in the production of its hamburgers. Of course, the cost of beef isn't the only factor affecting McDonald's or any other fast-food chain. Everything from the minimum wage to the cost of electricity, transportation, wheat (for making all those buns), etc. can have an impact. Other businesses have their own lists of key inputs. One expensive ingredient may have only a minor impact, but if many raw material costs are stacked against a company you are considering, perhaps you should look into another market sector altogether. 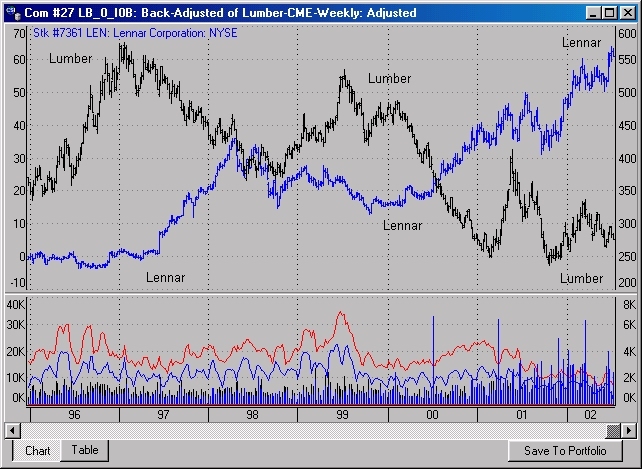 The chart of Lumber futures and Lennar Corp (below) shows a fairly strong inverse relationship between lumber prices and share prices, as might be expected when evaluating one of America's largest home builders. However, this relationship doesn't tell the whole story. Lennar is also involved in real estate investment and financial services, so a favorable lumber market is just one of the ingredients that points to price movement. You can probably think of other futures markets and other economic series that might shed light on Lennar's prospects. Lennar Corp, which specializes in home construction, real estate investments and home financing, shows a tendency to move opposite the price of Lumber futures. The Lennar price, which uses the scale at left, correctly falls below zero because the series has been adjusted for splits and dividends. These charts hold a strong suggestion that one should take a futures position in a future raw material while simultaneously taking an opposite position in the consuming security, but you must be very careful to consider many other background factors before attempting to take on such an apparent opportunity. Examine the broad scope of other futures data in addition to what has been suggested here before launching your investment plans. 1.) Barley, an important raw material necessary to produce beer, is an important element in the price of Anheuser Busch Cos Inc (BUD) and other brewing companies. 2.) The future kilowatt-hour price for electricity should be consulted before taking a position in aluminum futures, a commodity that depends upon electricity for 95% of its value. The cost of the bauxite ore represents less that 5% of the value of an aluminum ingot. 3.) The cost of oil, the energy resource necessary to fuel an airplane should be an important consideration before taking a position in an airline stock. How much of the company's future fuel costs have been controlled through hedging? It is also important to watch the news of any OPEC decisions that will certainly affect U.S. oil suppliers. 4.) U.S. new home starts should be carefully reviewed before taking a futures position in the lumber industry. 6.) Examine the UA-supplied Federal Funds Rate daily movement before taking a position in the bond markets. 7.) Silk and Cotton are mildly competing products which should be consulted through an examination of Japanese Dried Cocoons and U.S. Cotton markets. 8.) The cost of crude oil futures might be traded off with the cost per KWH of electricity futures since both are important factors in the production of energy. The above list is just a quick sampling of possibilities. It is a start on the step-by-step process you might follow before taking on various risk alternatives. Perhaps the most important element in a strategy to balance risk is the selection of appropriate alternatives that allow trading off one likely event with another. Stock market investors should always consult futures market data for information on the raw materials necessary to make the products of any potential stock acquisition It isn't always necessary to take a position in a futures market to balance potential risk in a stock, but it is always helpful to understand the raw material implications that futures markets may portray. Recent events in the stock markets have leveled the playing field between the stock and futures markets. Investors now shy away from both of them. Is it time to practice shoebox-in-the-mattress money management? Perhaps a better alternative is to play with the big boys of industry and use the futures markets to educate ourselves, and maybe even hedge our bets, adding a bit of a safety net to catch what's left of our investment capital. Speculative trading involves risk and is not suitable for everyone. No statement in the CSI Technical Journal should be construed as a recommendation to buy or sell any investment vehicle. Although UA reports the Bullish Review's COT data in a timely manner, many subscribers find Steve Briese's bi-weekly commentary to be an invaluable resource for in-depth interpretation. Call 850-932-9411 for information. Neither the Bullish Review nor Steve Briese is affiliated with CSI. CSI does not endorse nor stand behind the products or services of any outside firm. Over a year ago we promised an addition to Unfair Advantage that would be an accounting program to keep you apprised of your stock or futures trading account progress and performance, both historically and for daily assessment purposes. We are pleased to announce extensive progress has been made and the product is rapidly nearing completion. We call this enhancement module "Position Manager" because each day it will tell you the net change from the day before for all your holdings. It also offers an ongoing equity level for many markets throughout the trading day. This software was engineered to accommodate multi-national investments, as values can be seamlessly calculated in the currency of choice, such as U.S. Dollars, British Pounds, Euros, Yen, etc., regardless of the currencies used for reporting your various positions. The internet-linked capability that will price open holdings throughout the day uses the following update schedule: Stock positions will be delayed by seconds, futures positions are expected to be delayed by 20 minutes, and mutual fund positions will be delayed by a day. With this program, you can stay abreast of the value of your account at all times.